Did you know that Bruce Stadium, now GIO Stadium, was originally constructed to host the 3rd Pacific Conference Games in 1977? 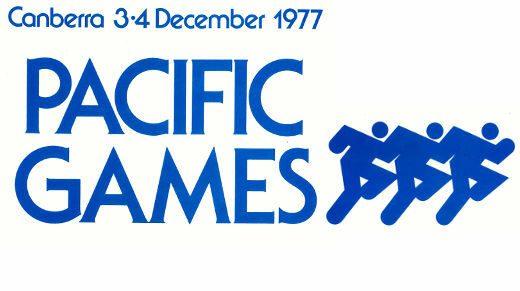 The Pacific Games were an athletics competition held every four years between 1969 and 1985. Up to 1981, the Games were limited to athletes from Australia, Canada, Japan, New Zealand and the United States. Other nations could enter the 1981 and 1985 Games. Various government departments had a role in organising the games, and the files and brochures documenting Canberra's role in the 3rd Pacific Conference Games is our December Find of the Month. "The Australian Amateur Athletic Union has suggested to the Federal Government that staging the games in Canberra would be an appropriate way of marking the 50th anniversary in 1977 of the transfer of the federal capital from Melbourne." "A decision has been made to build the stadium in Canberra for these games. A spokesman for the National Capital Development Commission has said that a complex of this nature is envisaged in the north-western section of Canberra, specifically in the Belconnen area. This proposed development will be brought forward to be ready for the 1977 games." "It is our opinion that Canberra can hold the Pacific Conference Games in such a manner as to bring lasting credit to our country, to bring the Capital City of Australia into the forethought of all participating countries, and to bring to the Pacific Conference Games the prestige and importance so rightfully deserved. Above all this committee is convinced that Canberra is the best venue available in Australia. The location in a pollution free environment, the temperate conditions of weather experienced in the area and the architectural beauty of our City will ensure the Games success. The 16th Olympiad was known to all participants as the "friendly games" - if Canberra is selected as the venue for the Pacific Conference Games the hospitality of the Canberrans and the choice of Location will ensure that the "friendly games" are again held in Australia." 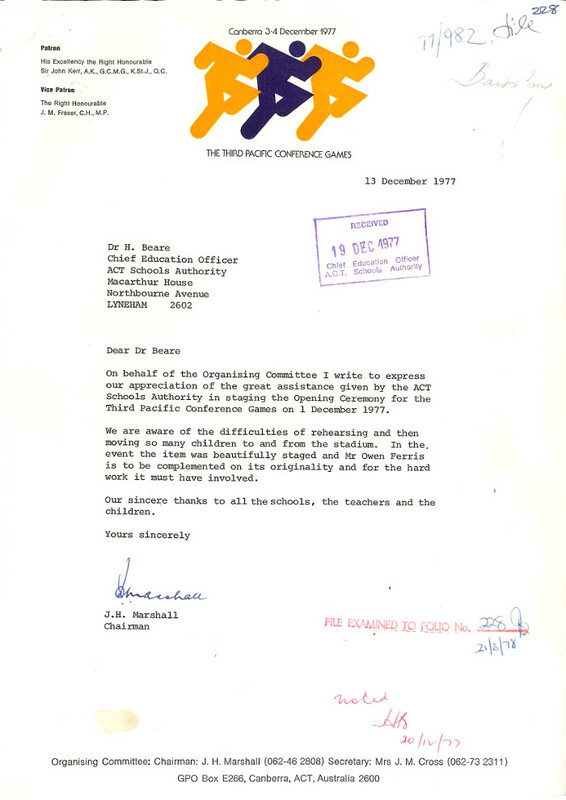 On the 1st July 1974, the Games Organising Committee officially announced Canberra as host for the Games. The Committee also decided to hold a pre-games athletics meet in Canberra on 30th November 1977 as a trial run to the main event. 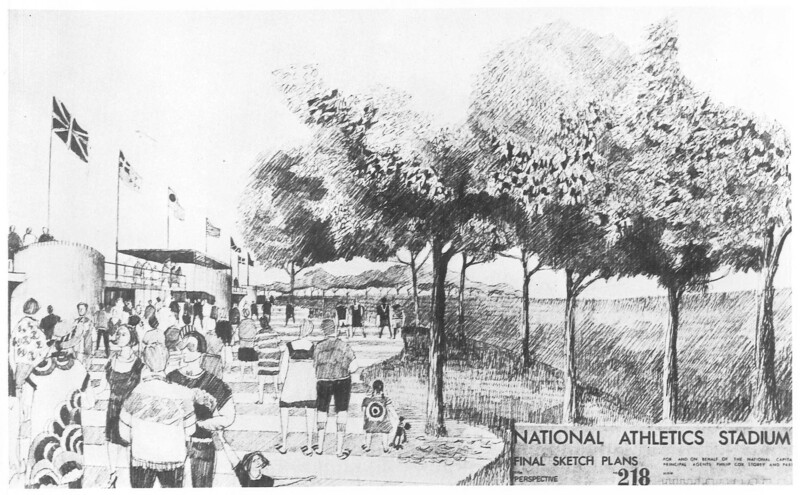 In 1976, the ACT Administration released a Pacific Games media pack that included press releases, NCDC sketch plans of Bruce Stadium and tourist brochures. The media releases anticipated that "many thousands of people will throng the stadium for the two-day meeting to enjoy the spectacle and excitement of world champion athletes in competition." The Pacific Games would be "the first major international athletics meeting to be held in Australia for fifteen years and are expected to generate great enthusiasm among all sports fans, both in Australia and overseas." Sketch of Bruce Stadium. Click on image for larger view. A world-spanning event needed world-class facilities. 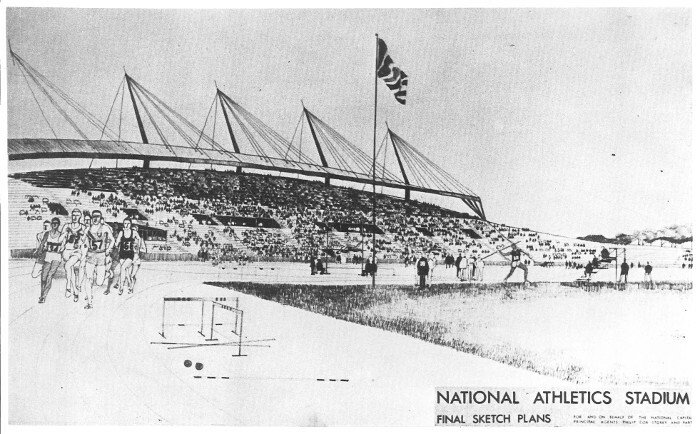 The NCDC built the National Athletics Stadium to have a spectator capacity of more than 16000, with "a spectacular grandstand structure." 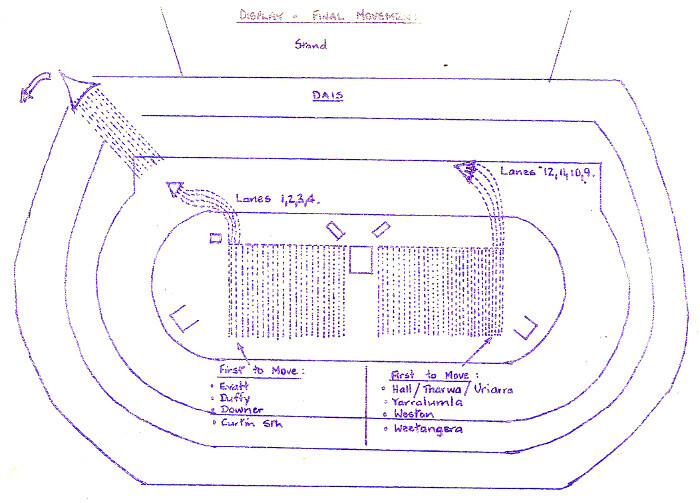 It boasted facilities for javelin, shot, jump and other field events, along with an eight lane track circuit, built to international "all weather" standards. 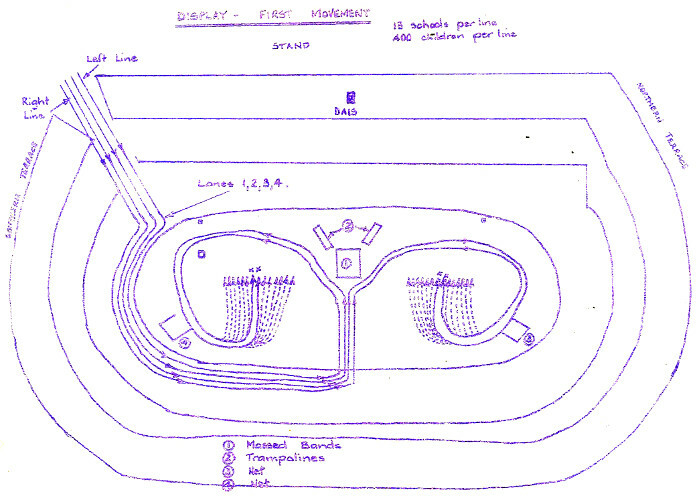 Sketch plan of Bruce Stadium. Click on image for larger view. 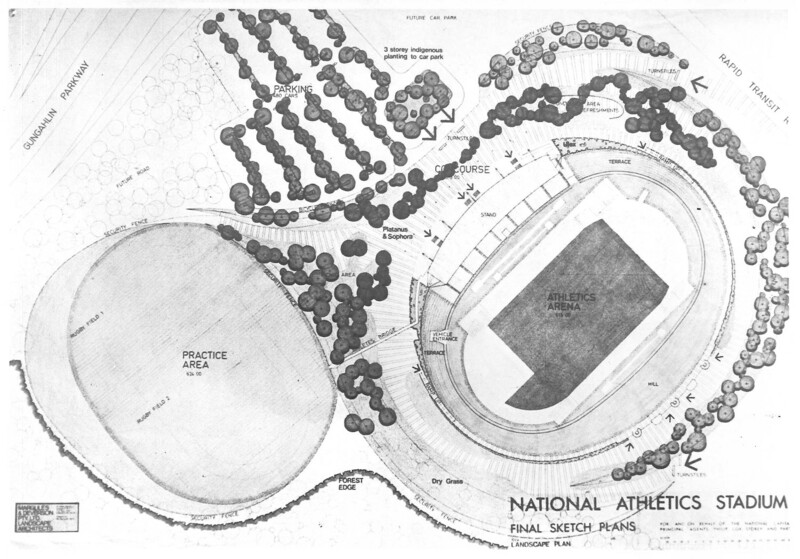 "Set against an impressive natural backdrop of the forests of Canberra's Black Mountain and with views towards a low range of hills, the National Athletics Stadium with its carefully landscaped site and its distinctive, high masted grandstand structure offers an imposing and well-equipped venue for the 1977 Pacific Games." Sketch of Bruce Stadium grounds. Click on image for larger view. "The concept of children playing a part in this major community event is attractive and would be a memorable experience for those children involved." The Games Opening Ceremony featured approximately 1600 Year 5 and 6 students from 54 ACT primary schools. After entering the stadium in four lines of 400 the children performed a routine to the theme of “Botany Bay”. A choral finale by the children followed before leaving the stadium. After the Games the Organising Committee sent their thanks to Dr Beare for the schools' contribution to a "beautifully staged" event. The Canberra Times published a two-page "Souvenir Supplement" on 5th December 1977 after the Games. Crowd numbers were down on the estimates of the Games’ organising committee. Despite this, deputy arena manager Harry Ralph was reported as saying, "Everything at the Games worked just like clockwork." "But the formalities ended with a rush after that when athletes from all teams broke ranks for a joyous victory run around the arena." "They started out running in teams, but after a few minutes Australians were running with Americans, Canadians were cheering the New Zealanders, and the Japanese were doing their best to throw everyone in the air." Australia came out on top in the event, with a final tally of 17 gold medals, ahead of the United States' 10.